if you speak about SID/STAR files direction you must follow following rules. - Direction is the direction of the first STAR leg by thinking "I arrived by ....."
So for this chart, the direction should be S (South), right? Have a look into the skyvector.com charts (world HI or world LO), which sometimes helps to find the right direction. The corresponding airway to the transition waypoint DENVO is "SE" southeast from OBBI. I didn't believe myself, I finally got a free pro-similar A320! Nice job guys! Really nice job! the FMC is awesome! Please continue this great work! THANK YOU! REALLY THANK YOU! The popup MCDU is still transparent, I just changed the black to red 0 blue 1 green 0, it's still black but not see through any more. I would like to keep the popup MDCU at least because I know there has been talk of removing them. The popup MCDU would be great with improved textures, I know our texture expert was looking for something to do. That's what I use as I don't really want to zoom in so far that I cannot see what's happening out the window, I hope they both stay. I also need the engine start popup as the 3d ignition switch has never worked for me. I can still select slats 1 with no flaps when on the ground Francois. That's because I use an axis for flaps but select them via the mouse is ok. It's not a big deal but at least I think I found out why we have some differences in the flap logic. @Flyer10. I read time ago that air model can't show it because there should be only 4 flap possible positions available in aircraft.cfg. But I am not sure on this! Thanks for that, I will do that now and it's an easy fix for Francois to add for the release. The line "backgound_color=..." in [window07] already exists. Just change the numbers from 0,0,0 to 10,20,30 as stated above. Thanks Prosdocimo for this fix. It works on my end in the VC and the 2d cockpit day&night. Based on the latest 2.0G release, I've attempted to fix the night rendering of the MCDU once and for all. There are now four background bitmaps, switched depending on light state (no cockpit lights, panel only, cabin only, cabin and panel). White and orange button lighting when panel lights are on is retained. The .xcf file can be used for altering the MCDU bitmaps in terms of brightness or color matching or whatever (make sure to export in 24bit bmp format). Install by making a backup of "A32x_FD-FMC\A32x_MCDU.xml" and then put the modified files into "A32x_FD-FMC". Last edited by Bjoern on 20 May 2018, 13:46, edited 1 time in total. Hi I have an issue with dome lights. I installed the last complete package 2.0G. All textures required by the modified MCDU gauge are present in the archive I've uploaded and the MCDU displays just fine in every light condition even after testing it on my desktop PC! The only small error I could find in the modified MCDU gauge is in line 620. "A32x_MCDU_W.bmp" should be "A32x_MCDU_O.bmp", but this has absolutely nothing to do with the gauge background! I have no line indications in the xml file. I found in total 2 "A32x_MCDU_W.bmp" entries. Is the first or the second one relevant to be modified? Last edited by wulfbindewald on 19 May 2018, 08:37, edited 1 time in total. Bjoern, I was talking about MCDU popup window. The console Mcdu is fine. This has been explained by Francois (13.April), who decided to link the panel light with the DOME dim light. I agree, independent switches are more realistic. My favourite visual appearance in the VC during night needs the DOME dim lights too, because otherwise the VC panel with switched panel lights only looks too "dark", so it has been linked. If you never use the orange cockpit lighting, you won't need to do anything at all. The fix was specifically intended for the popup MCDU! One bitmap is very dark though and might fool you, but they're all images of the MCDU! panel 2.0G: MCDU 2d popup with background_color=10,20,30 and one pic for the basic soln 0,0, for reference. Bjoerns MCDU hotfix from 17.May corresponds to the 10,20,30 visual appearance on my end, therfore not explictly shown. Separate versions for the 2D panel and VC should DEFINITELY fix this. All of this goes into "A32x_FD-FMC". Don't forget to replace the relevant parts of the lines in the panel.cfg files with the new gauge names. See the included text file for hints. Thanks for making us increase the required development and maintenance effort. I, for one, do not appreciate it. I got next result with the update from your link. description=Project Airbus presents the Airbus A321. 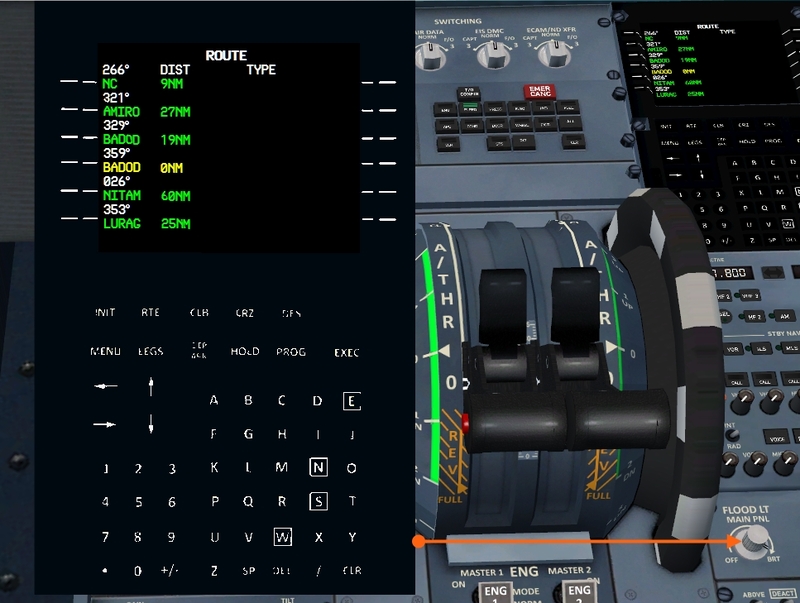 Features include dynamic wingflex (with input from several new variables), drooping control surfaces, hardcoded double strobes, and over 40 other custom XML parts. Visit us at www.pairbus.com. Hi Bjoern, based on your 2.0G hotfix from 20.05 at 13:13. I interpreted your installation description as follows. - To throw both new xml files "A32x_MCDU_2D.xml" and "A32x_MCDU_VC.xml" and the .bmp files into the existing A32xFD-FMC folder. - To delete the existing file "A32x_MCDU.xml". But this is probably not necessary acc. to the panel.cfg entries. The popup 2d MCDU looks fine except pic 3, but the visual impression looks similar to other additional gauges e.g. pic 3 top right. It would be nice, if you send us your results in pics, if they differ from the shown pics below. Please advise, if the installation proc is wrong. Wulf's screenshots look like what I have, but he slightly screwed up the installation. "A32x_MCDU_2D" is for the popup version in [Window07] and "A32x_MCDU_VC" is for [VCockpit01]. Thomas screwed up altogether, needs to start over and think about the relationship between file names and installation locations, hinted at in the previous sentence. Hi Wulf, I realized that in your Mcdu I can read "version 2.0 beta G". I don't in my installation, but I installed the last Françoise 2.0G from his link. I only put my textures. What's wrong in your opinion? I'm close to finishing an airplane manager (payload, fuel, doors, a/c configuration) for the A320 (for now; will try to make it smart enough for the A318-21 later on). This will eliminate the need for your .ini file, since all custom configuration items in Config_A32xFD-FMC.ini (metric alt, barometric setting, etc...) will now be saved on a per-aircraft basis after initial configuration directly in the simulator. FMC save data, i.e. Save_FMS_Data.xml, Save_FP.xml and Load_FMS_Data.xml and the files it generates will NOT be affected. ONLY the AIRCRAFT SYSTEM related loading and reset code in "A32x_FMS_init.xml" will be transferred to a new gauge to integrate them into the load/save system. The auto reset and auto-configuration (air/ground) system can be retained, but I'll need to work it into the other stuff that'll need to be loaded and saved. This is strange, because I did not change anything at first within the eight new 2.0G panel/aircraft folders (except livery changes in the aircraft.cfg). May be it helps, if you consequently delete any older panel folder at first from 2.0F downwards, even 1.55 or 1.6, to get a clean 2.0G panel, not any unwanted mix. Don´t forget to delete the old A318FD-FMC.CAB, A319FD-FMC.CAB, A320FD-FMC.CAB and A321FD-FMC.CAB files in the FSX/Gauges folder. What I did at first: "cut (not copy) and paste" all older panel related files and folders into a new archive folder outside from FSX. Bjoern´s MCDU hotfix, see above, did not change the panel version number displayed in the MCDU. 1- Why master caution light is on while it's useless? Otherwise it's a nice aircraft, great job guys! Don´t forget to delete the old A318FD-FMC.CAB, A319FD-FMC.CAB, A320FD-FMC.CAB and A321FD-FMC.CAB files in the FSX/Gauges folder. 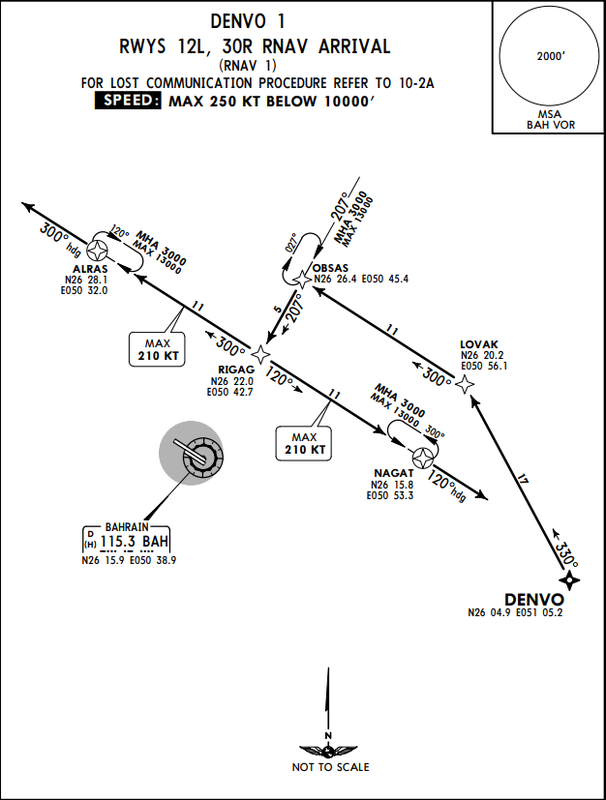 I have a question: If an airport has RNAV transitions, should I put it in the procedure? I am not sure, what you mean as there are different "RNAV transitions" during a flight cycle. May be one concrete chart example and pic would be helpfull and a short description how you want to define the proc. Sorry it was my mistake, I didn't understand it well, now I got it. Thanks! In such case, what is the best? The std. hold pattern tracks are described in the "[EN] FreeNav DB Group Manual v4.15.pdf", chapter B1.4, and to be find in the freenavdbgroup.com download section. IMO the above mentioned pattern is a right turn inbound pattern and coded as ...,1,2,172,352,60 (e.g. for 60s) in the appropriate data file. I am asking what is better, use direct or parallel. I was only need '2' number in these. Anyway thanks! 1- When I was in flight, the panel suddenly lags. I can't click on any button in cockpit, but the screen still active. I made a manual landing because this. I can't change anything in FMS, it completly freezes! 2- There is a lot of space in HESH STARs, make it almost invisible in 3D version. Just 1 space between runways is really enough! Also the procedures are outdated. I will see if I can make an updated version. Please tell us which airport (ICAO), arrival and approach you have selected. Which fix was next when the panel began to freeze? Then there is a chance to duplicate this. Additional airport scenery used? Next fix: ------. I will explain: The problem starts from descent. I was on FL250. DELMA has altitude restriction 13000'. The panel start descent slowly (-700fpm)! I was thinking that is normal. But I end finally with FL220 on the approach point (I should be at 2200')! Then I opened 2D FMC via Shift+7. I start flipping pages between STAR and Approach to know what is the problem. I didn't change anything. Then I tried to close it via close button, but no success .I open the 2D FMC several times before to change some stuff and it works. I don't really know why it freezes this time without changing anything! Then all of the whole panel freezes except screens. Even the A/P. I only was able to disconnect it using my joystick button. So the freeze was only visually, I can control stuff with shourtcuts. Additional sceneries: IVAO EG HESH scenery, VATOJ OJAI scenery. I repeated your defined flight from OJAI (No SID chosen) to HESH (DELMA RWY 22L STAR), Approach: RNAV RWY 22L without any prob with panel 2.0G and A320_IAE, HSEH is FSX default (no add. scenery). Everything is as expected, but I recommend to use the hold pattern at IAF HS425 to avoid extensive speed break usage lateron. Have you put the throttle lever arms to idle during descent? I wonder if the panel freeze is relating to a propable conflict with the additional scenery. Just deactivate this scenery for test purposes. If I understand well, this shouldn't be the problem. Because FMC 2D panel doesn't work. Thank you so much, I'll do a test flight as soon as possible. If the simulator pretty much freezes and doesn't manage to capture a specific target altitude, it points to a problem with the autopilot logic, namely spamming K: type events to the simulator. I've tried to check "A32x_FMS_DES.xml" for any risk of spam, but the code is unannotated and very hard to read. So only François can do this. The A321 has different flaps, I could only find the full flaps setting which is 25 for both CFM and IAE, it's 35 on the 18,19 and 20. I assume the other settings are correct but they are hard to find. It's a bit confusing since the A319 apparently also uses 40 degrees deflection for "FULL". The SmartCockpit documents are nonspecific regarding the model that the tables apply to and is therefor of little help. Background: I'm redoing the flap indicator for the next fork and want to make it smart, i.e. auto-adapt the internal calculations to the model in use. Everything I have read is that the A318,A319 and A320 are the same (This was an airline pdf), there is a possibility the A318 could be changed if airlines go for the steep approach option to get into places like EGLC with a 6* glide slope. Maybe that was what you were thinking of with the A319? 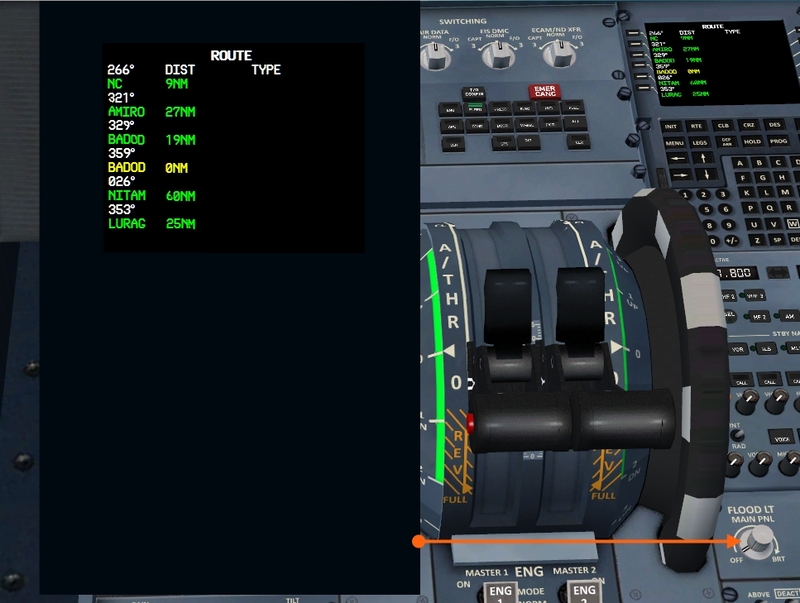 I actually fixed this myself a while ago and I found the flaps for the A321 were, 0-0-10-15-21-25 but it was so long ago I couldn't tell you where I found the info, I also had to edit the xml in order to get the indicator to match up too. http://theflyingengineer.com/tag/flaps/ confirms 10 for 1+F, 21, 25 for 3 and full so I am pretty sure 15 is correct too. ..is the only conclusive information that I could find on the flap configurations. 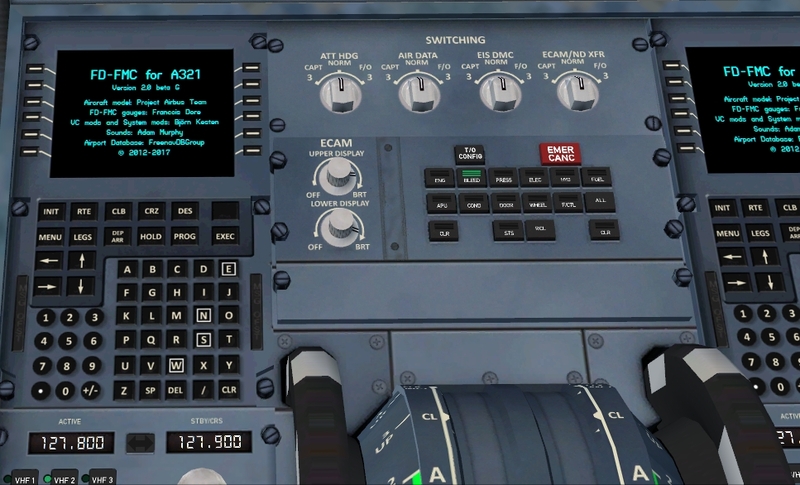 And I assume that the settings on the A319 also apply to the A318. So I'll work with that. Agree, it's weird that the bigger aircraft have less flaps even if they are using the same wing. Did you see the A321 has extra slots for more lift so it would make sense to give it a higher lift number in the aircraft.cfg so it will match the figures.